Mike Padua over at Shoot Film Co. has done it again, this time bringing to market a product that’s more than decorative. 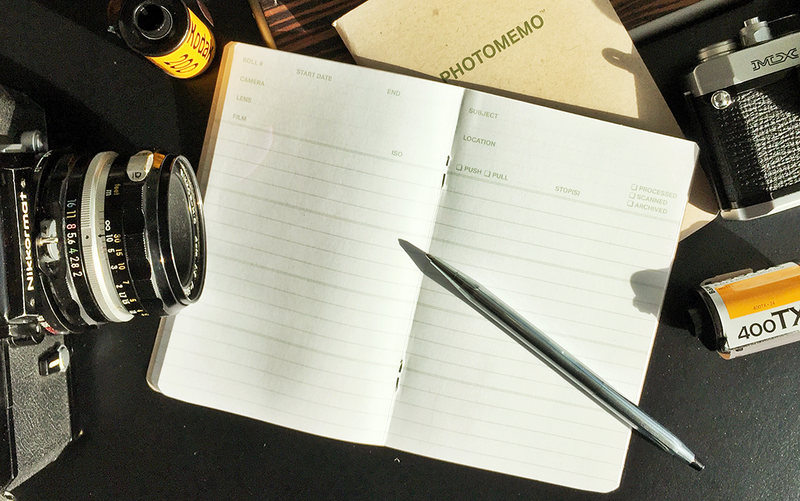 PhotoMemo is a truly useful notebook designed just for us. First, I was one of the consultants that helped Mike design PhotoMemo, and a beta tester. I wanted to let you know that right away in the interest of transparency. I’m going to do my best to offer the most unbiased opinions I can in this review, so if I sound excited, it’s because I truly am. This is the finished product of Mike’s hard work; I was just one of the people he bounced ideas off of. Taking in feedback from a handful of other photographers (a notoriously fickle bunch to start with) and beta testers, and marrying all those suggestions and critiques into a unified vision, was a symphony Mike conducted. I did receive one of five beta copies, which is already in my stack of “notebooks to use next,” and I also unexpectedly got a two-pack from the very first shipment of the final product. Thanks a million, Mike; I’m going to use the heck out of these! Lastly, Mike was a sponsor of the inaugural Expired Film Day, for which I am eternally grateful. His support (and participation!) undoubtedly contributed to the event’s success, and I look forward to working with him in the future. Shortly after I published my review of the Galaxy Photographer’s Planner and Handbook I got a message from Mike on Twitter. In my review, I was critical of the Galaxy book trying to be too much at once — a jack-of-all-trades, but clearly a master of none. Mike said he’d been working on ideas for a photographer’s notebook of his own for awhile, and that my criticism had struck a chord. He wanted to share his idea for a notebook with the film-loving community and he wanted my help to make sure it would fit the other end of the spectrum — excellence through simplicity — adequately. I bantered back and forth with Mike about what features were must-haves and which ones seemed like a bridge too far, and gave my feedback on sample page layouts and colors. He listened to my suggestions — and those of others — but the final product is entirely his. “Over the course a few weeks, I refined things and then started asking around for input from friends, and even sent out a few prototypes. I got back some really useful feedback and made more refinements,” Mike told EMULSIVE. My Twitter Direct message conversation with Mike goes so far back that the official Mac Twitter app can’t get to the beginning of it, so I can vouch for his meticulousness and painstaking care completing this thing. All that remains, now that I have the genuine article in my hand, is to decide if it succeeds at being the antipode of the Galaxy notebook — does it do one thing at a time, do it very well, and then move on? 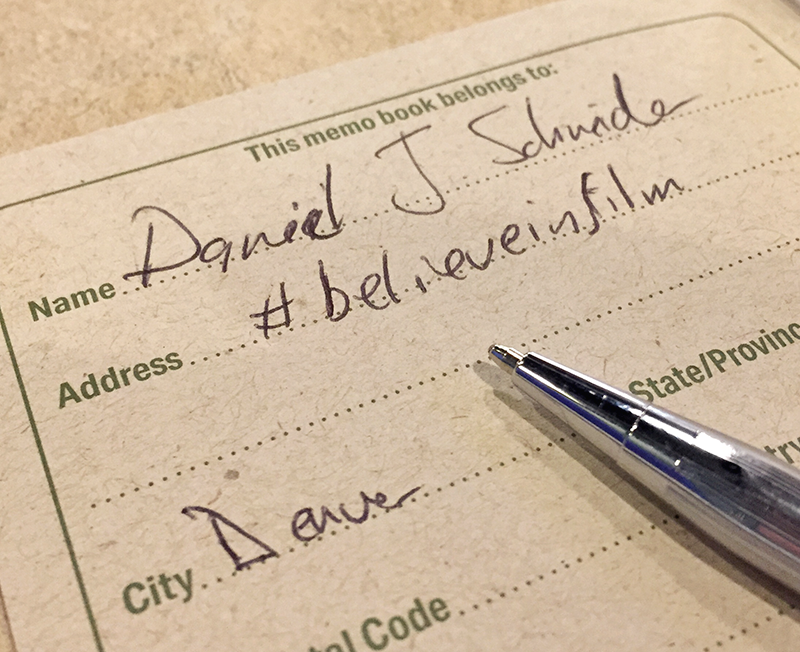 The PhotoMemo book is a 48-page paper notebook, 5.5 inches tall and 3.75 inches wide (when closed), not unlike the Moleskine and Field Notes journals (and their knockoffs) that you’ve probably had at one time or another. What sets it apart is the relatively unique matter between the covers. The “meta data” section at the top includes fields for: roll number, start and end dates, subject, location, the camera and len(es), the film stock and exposure index, push and pull indicator and number of stops, and status checkboxes for processed, scanned, and archived. But that’s it — just lines. They aren’t separated into named columns, and they aren’t even numbered. Mike intentionally limited the intrusion of the technical data at the tops of the pages in order to leave each photographer the freedom to record their rolls however they want. In fact, you don’t even have to record rolls. You can do sheets, or just use the pages for general notes, ignoring the roll details above. The ink on the page is an earthy medium green that offers enough contrast for good visibility but is desaturated enough to disappear into the background if you choose to go freeform and just sketch (or doodle…) on the pages. The ink was blue in the beta version, but the green is a good change. “My goal was to make it flexible – you can take general notes regarding a roll, like location or subject, or you can get really specific, like logging the exposure data on each exposure. Or you can do a combination of both. There are really no rules on how you can use it. I wanted the end user to be able to ‘make it their own,'” Mike told EMULSIVE in an interview. 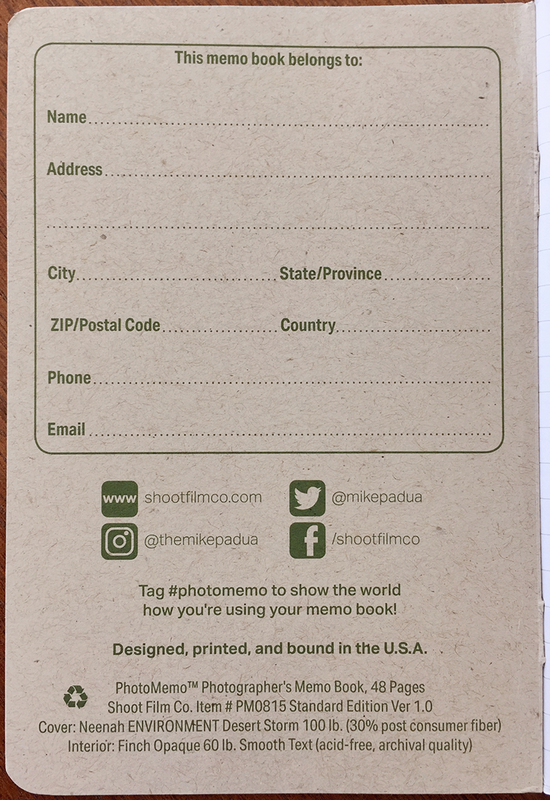 That “make it your own” attitude pervades the design of the PhotoMemo notebook, and it’s just one of several factors that make it clear this is an item of utility. Mike isn’t charging a premium for a fancy leather cover like a Moleskine, and PhotoMemo isn’t printed on cheap 24-pound paper like the $2.99 jobs you find in discount stores. The construction is sturdy and lots of care has gone into making it useful in a variety of conditions. Rather than waste pages on fancy introductions, descriptions and charts, Mike crammed everything that isn’t notebook space on the insides of the covers. From front to back, PhotoMemo is obviously designed to be used. In keeping with that ethos of utility, Mike even agonized over how big to make the book (and the size of the front pocket on my well-worn Domke F-5xb may have had an influence on the final decision), and how far apart to space the lines. I believe he settled on 6.35 millimeters, which is a third of a millimeter wider than the spacing on a Moleskine, which Mike felt crowded his writing and which I agreed would work great with a little more room. The inside front cover has a full-featured “This book belongs to…” section you can fill out in case of emergencies, although Mike didn’t add fields for your Twitter or Instagram usernames. What’s with that, Mike? The covers are made of 100-pound Neenah ENVIRONMENT Desert Storm paper, and the interior pages are 60-pound Finch Opaque archival and acid-free paper, designed to ensure that you can use both sides of a page without bleed-through. Both stocks are prized for their smooth finishes. The 30 percent post-consumer fiber cover stock is heavy enough to help form a solid base when you’re trying to write with nothing but your hand or an irregularly shaped, squishy camera bag behind it, and because it’s paper, you can write directly on the front with a regular ballpoint pen. One of my largest pain points with most Moleskines and their knockoffs is the difficulty I have creating an external label when they fill up and it’s time for filing. With PhotoMemo, I won’t be using paint pens and sticky notes any more. By this point you might be thinking I’ve got nothing bad to say, I’m just a bought-and-paid-for shill, or that I’m blind to the flaws since I like the guy who made thing. Well, it isn’t quite perfect, but I had a hard time coming up with any imperfections Mike hasn’t addressed. One thing I noticed right away, though, was the finish on the paper. It’s very smooth, which feels strange and almost painful to the dry hands I used unpacking it. And here in Colorado it’s always dry — doubly so in fall and winter. I expected the slick finish to make the lines from my pen narrower, since the ball wouldn’t sink in as far, but actually, the paper is fantastic stuff. I won’t complain about holding it with dry hands as long as it’s this easy to write on. I am a little concerned about how the two-staple binding will stand up to the abuses of being jammed in a pocket or camera bag and repeatedly bent, squished and curled, as compared to the rugged stitched binding of a Moleskine. On the other hand, it may be an acceptable trade-off since the PhotoMemo doesn’t have the useless pocket flap on the inside of the back cover. Maybe I’ll be able to avoid the host of oopses I get when my ball-point crashes into the edge of the flap and goes haywire in the back of my Moleskines. The first and last pages, which are divorced from any mate that would make a spread, feel a little out of place to me. 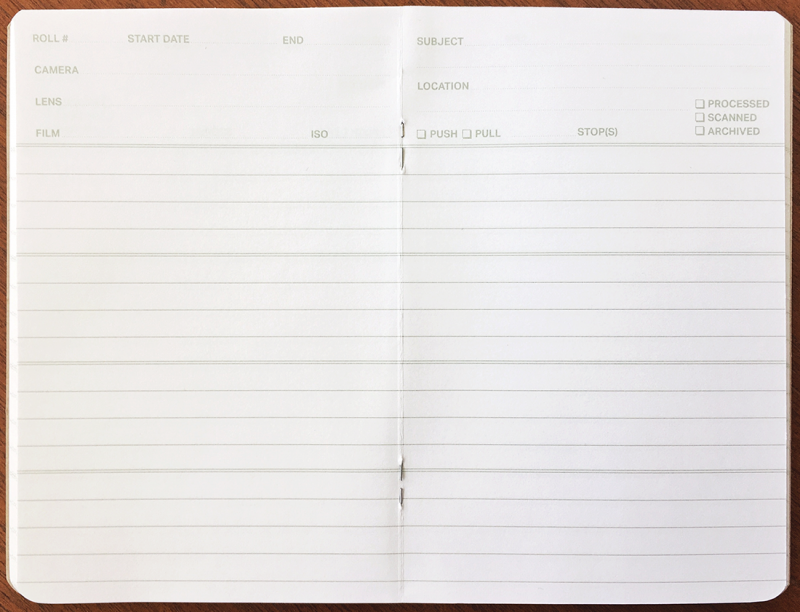 I’ve never been a grid paper user, and that’s probably why. But what’s wrong with plain white? Or maybe some marbled endpapers? In the final product, the dotted lines that follow the labels in the technical details fields at the tops of the pages are very faint. This might not be an issue in the long run; they may wind up being mostly ignored, anyway. But they are as hard to see in the notebook as they are in my photographs here. These few complaints may be things you won’t notice — or might even prefer. It is, therefore, entirely possible that I truly don’t have anything bad to say about PhotoMemo. $10 gets you a two-pack of notebooks over at ShootFilmCo.com, and at a $5 unit price, that’s a lot more notebook pages than my Moleskine addiction has gotten me. As I said above, Mike sent me a pack which I’m using as review copies for this article, and he may well have created an addict. Final verdict: I think this is an excellent product, and the truly fair price makes it a good value. I heartily endorse PhotoMemo and encourage you to make space in your camera bag and see if it works for you. Don’t miss all the other great patches, stickers and badges Mike has put together for the love of film photography, also at shootfilmco.com. I have mentioned before that my bags carry some of Mike’s patches and pins. 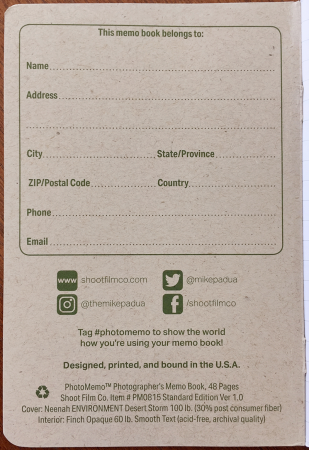 Connect with Mike directly on Twitter, Instagram, or Facebook, and let him know how you’re using your notebook by including the #PhotoMemo hashtag in your social media posts (he said so on the inside front cover). Additionally, EMULSIVE is awarding free two-packs of PhotoMemo books to seven lucky winners who make Mike laugh out loud tweeting, “I need #PhotoMemo because… (your hilarious reasons come next).” Read all the way to the end of that story, by the way.